A gem of a movie, this ones got a plot that keeps evolving, adding in new twists and turns every step of the way. A witty and creative movie, this film is funny, but it also goes much further than that. It’s got a plot that keeps on moving forward, constantly changing the relationship and dynamic between the two main characters. The second half might be the main storyline of the film, involving the competition these two con-artists run with each other, but it’s the first half that really gets our attention. That’s because these two go from strangers, to tricking each other, to working with each other, to being competitors. Other movies might have settled for a brief introduction before getting to the main storyline. This film spends half the movie leading up to it, and giving that setup such detailed attention really pays off nicely. 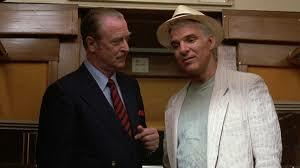 Dirty Rotten Scoundrels is a very charming and witty comedy about two guys trying to outdo each other with trickery. Both men are con artists and the film is about a sort of competition between them to see who can get a set amount of money from a specific woman. The great thing about this movie, however, is that it’s not only about that contest. In fact, nearly half of the movie goes by before the competition even finds its way into the plot. And that first half isn’t just about setup, but is actually the storyline progressing in ways that continually evolve. This movie is not only super funny, but it’s also very smart. At the start of the film, we Meet Lawrence (Michael Caine,) as he is posing as the king of a group of oppressed people, trying to seduce a woman and at the same time swindle her for money. This is a woman who is loaded with more money than she knows what to do with, and Lawrence plays the game just right, pretending he will not accept her charity no matter what the offer. She wants to help his people and he tells her that his people are too proud. This goes on for a while until she asks about the children. That’s when he agrees to accept her to help. We meet some of the assistants who work for Lawrence and are in on his scam, helping him be convincing in the part. Then we see him pay each of them out from the money that he has gotten from this woman. That ends are introduction to this character, and we now follow him onto a train, where he sits down comfortably to read the paper and travel to his next destination. Only something draws Lawrence’s attention away from what he’s reading. It’s a man named Freddy who pulls a scam of his own, right in front of Lawrence’s eyes. Freddy sits down at a table in the dining area of the train with a woman he does not know. He looks over the menu, talking about how hungry he is, but when he sees the prices, decides to just get a glass of water. That’s when Freddy starts telling the woman about his sick grandmother and how she needs an operation. Like with Lawrence, when the woman offers to help, Freddy rejects her offer. But after a while, he too accepts it, and as soon as she says she will buy his meal, he has a nice, long order ready, including a number of beers. The scene of Lawrence posing as the king and Freddy on the train were just introductions. The two men now share a train care together and one might think that here is where the competition is announced, in a sort of “strangers on a train” (the Hitchcock film) pact-way. Only it’s not. This is simply where Lawrence senses that Freddy could be trouble and gets a woman to seduce him into going to the next town. Only Freddy shows up back in Lawrence’s town the next day and he does it with his arm around the woman who was to be Lawrence’s next target. Now the fun is really beginning. Lawrence begins to sense that this man might be more trouble than he expected. This leads to Lawrence having Freddy arrested, and Freddy is locked up by none other than one of the men on Lawrence’s pay roll. Now with Freddy behind bars, he calls the one man he knows in this town, to help him out… Lawrence. At this point it is Lawrence holding all the cards, first having Freddy arrested, than flying in to save the day and get him out of prison. The only caveat is that Freddy has to get on a plane and leave town. It comes so close to working except for one little thing. A woman approaches Freddy on the plane that thinks that Lawrence is a famous king. It’s one of the women Lawrence scammed for money. Suddenly Freddy knows everything. So it seems like this is where the contest would start, right? Like now that both men know the truth about the other, it’s time to announce the stakes. Only the movie has even more cards up its sleeve. Instead of having the two men suddenly be enemies, it goes the opposite route and has Freddy train under Lawrence, allowing this man to be Freddy’s teacher in the art of the con. And Lawrence, who desperately wants Freddy to leave, accepts the offer. He feels that he will have much more influence over getting Freddy to leave if he is the one controlling the game. It’s also a sort of keep your friends close and your enemies closer thing. For a while the two of them pulls scams together, until finally Freddy has had enough. He isn’t getting to spend any of the money he makes with Lawrence and instead if forced to invest it in things like expensive wine bottles. This is Lawrence tempting Freddy to just leave town and try to make it on his own somewhere else. Only Freddy doesn’t see it that way. He wants to stay in this town too, and so the competition arises. The two men decide the town isn’t big enough for the both of them and they need a competition to decide who can stay and who has to leave. They both decide on the woman and the amount that the winner must get from her, and just like that, they are off and running. Lawrence starts out at a poker table beside the woman and Freddy pulls up in a wheel chair. Freddy has got a story about how both he and his grandmother need major operations. He says the name of a doctor who is the only one in the world who could help him, and Lawrence, being one step ahead, pretends to be that doctor. This way if the woman agrees to finance Freddy’s operation, she can pay Lawrence directly. What ensues from there is pretty wild. The movie keeps the twists coming all the way through the ending. This film works for all sorts of reasons, including story, humor, and performances by the stars. One the thing that makes it stand out so much more than most movies of the same genre, is that here, the relationship between the two main characters keeps on changing. It takes half the movie just for them to become enemies. That ever-evolving plot is what really keeps our attention, more than anything else.